Overwintering caladiums is the best way to keep your favorite varieties, and grow them year after year! Saving caladium bulbs over winter can sometimes be a bit of a challenge, but it’s not terribly difficult. Don’t worry, I’ll show you exactly what to do in this post! I am a sucker for caladiums. Every year I seem to end up buying at least one because they’re so beautiful and unique. Their colorful tropical foliage looks amazing in my shade garden or growing in containers. There are so many wonderful colors and varieties that I can’t resist when I see them at the garden center! But it’s expensive to buy caladiums every year to fill containers and gardens. So I like to dig them up and store the bulbs through the winter. That way I can save myself a little cash in the spring. Are Caladiums Perennials Or Annuals? It’s common to find caladium plants for sale in the annuals section of garden centers in the spring. But they’re actually tender perennials that can survive for many years with the proper care. Caladiums can be grown as perennials if you live in a warm climate (growing zone 9 or higher). But for most of us, they won’t survive the winter if left outside. So they must be brought indoors in the fall. 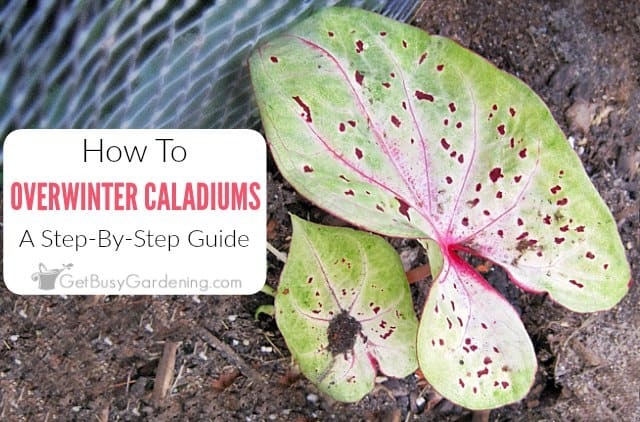 There are three ways to overwinter caladiums, and these methods will work for all caladium varieties. The method you choose will depend on where you live, and how you’re growing caladiums. In this section, I will describe each of the three methods for overwintering caladium tubers in detail. 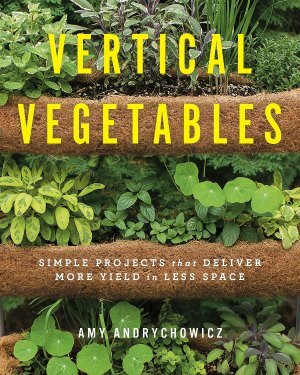 The method you choose will depend on the climate you live in, and whether you’re growing caladiums in pots or in the garden. If you’re lucky enough to live in a warm enough climate, you can just leave your caladium bulbs right in the ground all winter. They will eventually go dormant, and all the foliage will die back. But, once the soil warms in the spring, they’ll grow back better than ever. 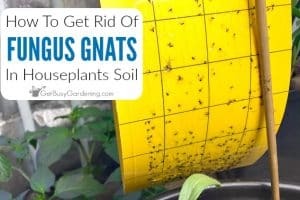 If you plan to leave them in the ground, then be sure they’re in a protected spot where they won’t get too much water. If kept too wet, caladium tubers left in the ground over winter could end up rotting. If you’re growing caladiums in containers, then you can just overwinter them right in their pots. 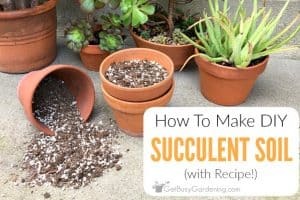 You can extend their growing season by several week if you bring the pots indoors before the temperature outside gets below 60F. Otherwise, as it gets cooler in the fall, the plant will naturally start to go dormant, and the leaves will begin to die back. Caladiums are not cold hardy at at all, so be sure to bring the pot indoors before it drops below 40F, or the bulb may not survive. 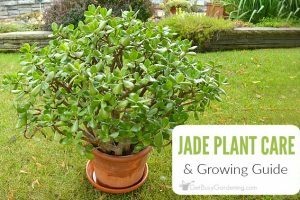 Once the plant has gone dormant, cut off all of the leaves, and store the pot in a dry location where the temperature stays around 60F. Allow the soil to dry out, and don’t water it all winter. When to dig up caladiums – Since caladium tubers will not tolerate frost, they should be dug up before it gets too cold outside. 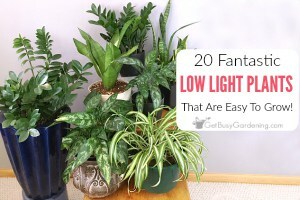 The foliage will naturally start to die back once the temperature gets down into the 50sF, but may not die back completely before they need to be lifted from the garden. Tips for digging up caladium tubers – Use a garden fork or spade shovel to gently lift the tubers out of the ground. Be sure to start digging far enough away from the plant so that you don’t accidentally cut or damage the bulbs. You can gently shake or brush the access dirt from the bulbs, but don’t wash it off. Preparing caladiums for winter storage – Once the tubers have been lifted from the garden, allow them to cure (dry out) for a week or so before storing them. After the bulbs have dried, caladium leaves will usually start to drop, or easily pull away from the tuber. Remove all of the leaves before storing bulbs for winter. 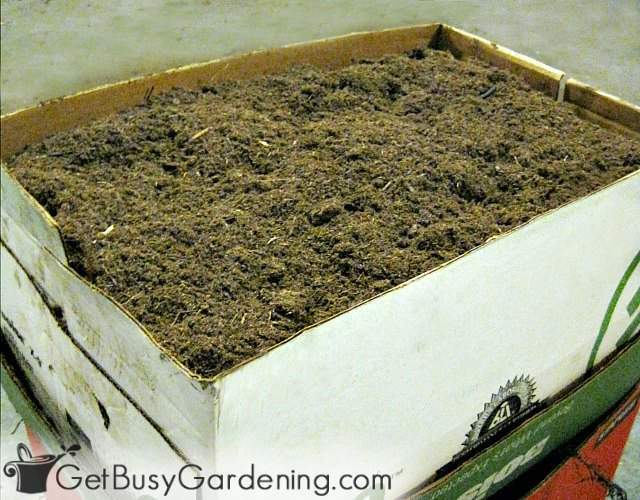 Storing caladium bulbs for winter – I like to pack my bulbs into a cardboard box filled with either dry peat moss or coco coir. But you could mix in some perlite if you have that on hand, or use another type of medium like sawdust, newspaper or pet bedding. Just be sure your packing material is totally dry. Pack the bulbs loosley and so that they aren’t touching each other. Place the box on a shelf in the basement or other dark location where they will stay dry and the temperature is around 60F. You don’t have to do anything special for dormant caladiums in winter. Whether left in the ground, in pots, or in storage, the most important thing is to be sure they aren’t getting too much water during dormancy. If they get too much moisture during the winter, they will rot. It’s also a good idea to check on them a few time through the winter to make sure they aren’t molding or drying out too much. If you find any that have mold growing on them, throw them out immediately so the mold doesn’t spread to the other bulbs. 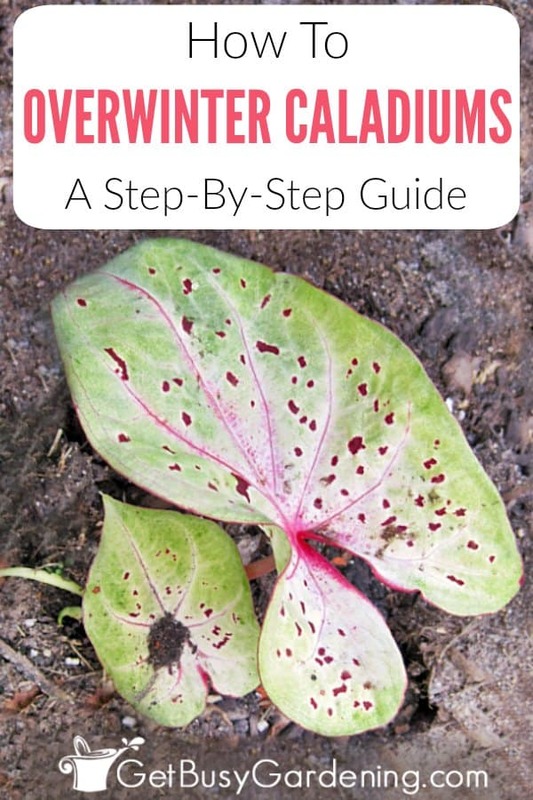 Below you’ll find the answers to some of the most common questions I get about how to overwinter caladiums. 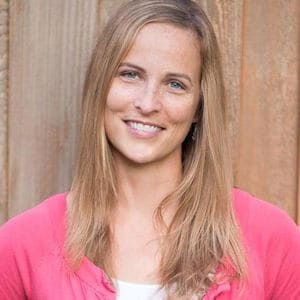 If you can’t find an answer to your question in this section, or anywhere else in this post, then please leave a comment below and I’ll be happy to answer it. Growing caladiums indoors as houseplants is pretty difficult. The plants naturally requires a dormant period during the winter months, so it’s best to allow them to rest. You could certainly grow your caladium indoors through the summer, and then allow it to go dormant during the winter. It’s important to note that all parts of the caladium plant are poisonous, so be sure to keep them out of reach of any plant-eating pets. Can you leave caladiums in pots over winter? Yes! See the full instructions above under the section titled “Overwintering Caladiums In Pots” for detailed instructions. Can you leave caladium bulbs in the ground over winter? Only if you live somewhere warm. Caladiums are hardy in USDA growing zones 9 and above. Do caladiums come back every year? Yes. With the proper winter care, caladiums will grow back year after year. How long can you store caladium bulbs? In the proper conditions, caladium tubers can be stored for several months. I recommend planting them every spring to keep them growing their best. But if for some reason you are unable to plant them right away in the spring, keeping them in storage for a few extra weeks/months should be fine. Just check on them periodically to be sure the bulbs aren’t too dried out. If you’re wondering where to buy caladium plants or bulbs, you can usually find both for sale at you local garden center in the spring. Plants growing in pots will probably be in the annuals or outdoor tropical plants section, or mixed in with the shade plants. Most of the time, you can find dormant caladium tubers for sale with the other tropical summer bulbs (like canna lilies, dahlias and elephant ears). Of course, you can always buy caladium bulbs online year round too. Growing caladiums from bulbs is fun and addicting! Now that you know how to save caladium bulbs over winter, you can keep your favorite varieties year after year. Plus, once you get the hang of overwintering caladiums, you won’t have to feel guilty buying new plants every year. Share your tips for overwintering caladiums in the comments section below. I successfully overwintered my first caladium. I dug up the tuber before the first freeze, cut off all the foliage and stems, shook off as much soil as possible, then put the caladium tuber in a metal holiday cookie box with a tightly-fitting lid and a bunch of what seems to be wood shavings (had come with some bulbs I bought and I saved it). I made sure to put wood shavings all over the roots to dry up any excess moisture. Then i kept the covered metal box in a room with temp set at 55 degrees all winter (to save on my electric bill, not to baby the caladium!). Come warm weather in spring, I replanted it. It took quite a while, but eventually leaves appeared, and the thing was much bigger than the previous year. This fall when i dug up the tuber I discovered it was now four tubers– apparently it pupped over the summer! I'm just hoping I didn't leave it too late this time around. @Anonymous – Wow, that is awesome!! Good for you! Thanks for sharing the details of how your overwintered your caladium tuber! How exciting that you have four bulbs now too. Good luck storing it again this winter, hope it works for you again!! Last fall, I dug up my caladium tubers, dusted them off, allowed the to dry for a week or so, the put them in an old onion bag. I hung them in a cool, dry, dark place all winter. In May, when night temps were above 50, I planted them about 2″ deep in my pots. Watered and waited. It took a few weeks…maybe a little over a month before I saw any activity. Then all the sudden they started growing and ended up looking great. I plan on trying overwintering them again this fall. Wow, good for you!! Thanks for sharing your tips for overwintering your caladiums. Good luck, I hope they will survive for you this year too. I am in Zone 8. As far north in Florida as you can go. I was told by a professional to dig up my caladium bubs, make sure they are dry put them in a pot in a cool, not cold, place to overwinter them. Being a person who is prone to go against the best advice. I left them in the ground with my usual amount of winter much. They all survived our winter,below freezing many nights. They even multiplied. I have done this with elephant ears for several years also. I do the same thing. I live in North Florida along the coast. We have been changed to Planting zone 9. So jealous that you can leave your caladiums in the ground all winter! That would be so much easier, LOL! I usually let the pot my caladiums are growing in go dry and then bring it inside and tuck it somewhere out of the way. I put it back outside once all frost chances have past and water it well. Keep it moist at this point, but don’t expect any sprouts until it gets good and warm. Then feed it good and wait for the show. They do tend to decline after a few years and then I buy new ones. Here’s the deal with these plants: When the temperature is constantly below 60 degrees, but not yet frost, remove the whole plant from the soil, line them up in a basement, tubers not touching. Let them wilt. Then, cover with peat and vermiculite. In the spring, plant in rich soil again when weather gets warm. These plants need heat to sprout again. I usually plant in pots, and then have the pots sit on the patio where it is warmer than the flower bed soil. Then, after they’ve had a good start, submerge the pots into the flower bed soil, mulch. You’d never know that there was a pot there! Plus the pot keeps the plants from competing with other roots. 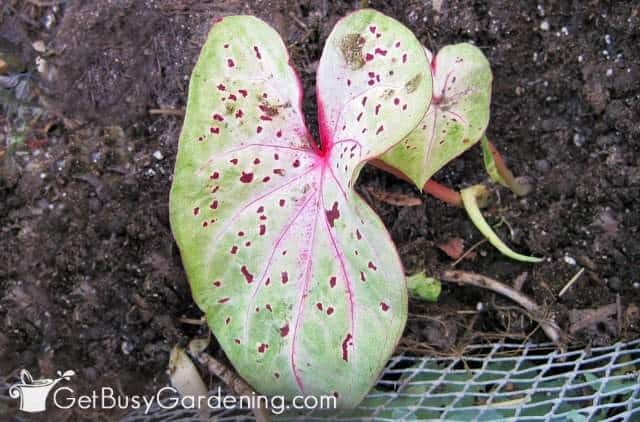 Awesome, thanks for adding your tips for overwintering caladium bulbs! I tried starting caladiums in my house in March to get a jump on the growing season. Nothing happened until I put a couple of pots directly on a hot air heating vent. They then sprouted quickly. These things like it hot. Thanks for sharing this great tip for how to bring caladiums out of dormancy!